Today's post is a little bit different and kind of a random one but it was just something I was feeling passionate about as of late. You may remember from last week that I was debating whether to keep these over the knee boots or not. I asked for your feedback and for the most part people loved them and encouraged me to keep them, but a few people told me that they didn't like them. I really appreciated that and it got me thinking about how other people's opinions have influenced what I wear sometimes. And that upset me. Ultimately I decided to return the boots, not because a couple people didn't like them but because I didn't think I loved them. It brought up thoughts that when I put outfits together both on here and IRL a lot of people probably don't like them. And while that may seem hard to accept I'm pretty much okay with it. 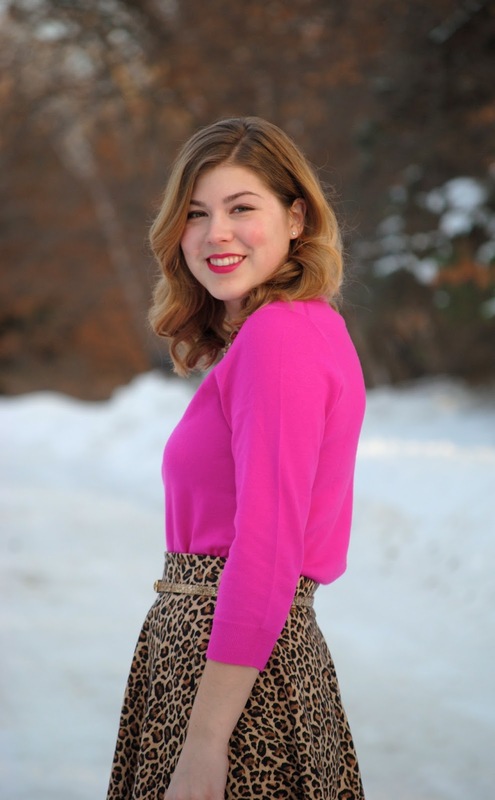 Most of the time I'm pretty good about just saying screw it, and wearing what I want (see faux fur leopard coat, pink pantalons, and neon pink + leopard outfits) and I wanted to encourage you to do the same thing. I 100% realize that it's easier said than done because being judged is straight up scary. But I always try to keep in mind something that my grandma used to say, "No one's looking at you." That may sound harsh, but honestly we get so worked up about the way we look when in all honestly most people (who aren't you) don't pay it much attention. Can you remember what your coworkers were wearing yesterday? Because I can't! Just try to tell yourself that if you're having a day where you feel self conscious. You should also ask yourself if what you're wearing makes you happy because that's important! Clothes don't have to just be functional, I firmly believe we can draw confidence and have our moods lifted just by what we're wearing. Whether it's a lemon shaped purse, or comfy basics what you wear should make you happy and confident. I'm not advocating in favor of trendy pieces or basics but just to take stock and realize what works for you. Which brings me to my last point: you don't have to follow the trends. I know it may seem like everyone is wearing something, especially if you read a lot of blogs it can seem like literally everyone is wearing XYZ trend. But then you go and look around and actually no one outside of those bloggers are wearing chokers/OTK boots/Rockstuds. Anyway, what I'm trying to say is that you shouldn't feel like you need to keep up with the trends. I definitely don't. There are some I love and others I observe from the sidelines. If following and trying the new trends brings you joy then do it! If wearing a uniform of sorts every day floats your boat then more power to you! This post was a little rambly, and I apologize for that, but basically I just wanted to say you're awesome and no matter what you wear you're going to be awesome, so just go with what makes your heart happy and I'll try to do the same! You may have already seen me sing Essie Gel Couture's praises on Instagram, but it's so good I thought it warranted a blog post too. Shout out to my friend Kara who made me realize I need it in my life. I am by no means a beauty junkie, but I do pretty much always have my nails painted because my hands are manly and I think it makes them look a little more feminine😂 Anyway, I've tried my fair share of nail polishes but never really dabbled in at home gel polish for some reason. I've always liked Essie because their colors are so on point but didn't buy it much because their brushes are pretty terrible. So tiny and no control. Thankfully that is not the case here! Honestly the brushes alone make the Gel Couture worth it. They fan out and you can do pretty much your whole nail in one stroke (seen below). I'm not sure what it is about the brush but I made the least mistakes of my life when using it, and I am one messy nail painter! This color is "Spool Me Over" and it's a beautiful peachy pink. They're more expensive, but honestly so worth the price. Once you buy the top coat it will last you a while too. Above is "Rock the Runway" and it's a beautiful true red. This is only one coat in these pictures! So pigmented and opaque which I love. But the very best thing about this polish is the staying power. I kept it on for almost two weeks with no chipping (I know!!) just some grow out as seen below. The top image is the day I painted them, the middle is 7 days after I painted them, and the bottom is 10 days after. I played several hours of volleyball and applied a ton of sunscreen with this polish and there's very little evidence of that. You can see they lost a little bit of their shine, but that's to be expected after 10 days. Even though I love to have my nails painted I hate the actual process of painting them, so this is a dream come true. I joked to Kara that I never want to wear anything else, but it's pretty much the truth. The above color is "Stitch by Stitch" and it's a beautiful bubblegum pink. 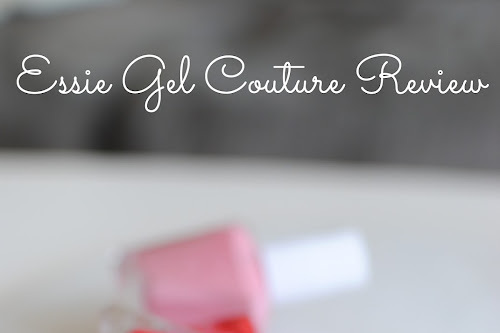 I may be totally fan-girling over this because I've never done gel before, but either way I would highly recommend! Do you have a nail polish you swear by? ps: this post is not sponsored, honestly just love this product! Cardigan: Halogen via Nordstrom. Shell: Halogen via Nordstrom. Jeans: J. Crew. Booties: Sole Society (similar). Purse: Forever 21 (similar). Hat: Anthropologie (similar). Sunglasses: Ray-Ban. This weekend was pretty relaxed. We took Louie to the dog park a couple times and it went so well! I was worried that he was going to attack another dog, or get attacked, but he had so much fun and we wore him out for a couple hours, which is a win! Other than that we ran errands and beat the heat inside haha. Not ready for it to be Monday already, but what can you do? Just in case you don't read any other blogs or possibly live under a rock, you may not have heard that the Nordstrom Anniversary Sale is going on right now and fashion bloggers are going ham (myself included). I figured that a good amount of my readers may not have heard about it, so I thought I'd share my favorite items today now that the sale is open to everyone and not just cardholders. If you've already read a million posts like this one then I won't be offended if you stop reading ;) there are some fit reviews too at the bottom of the post for items I ordered! I apologize for the poor quality photos! I got home from work late and by then the lighting was terrible, but I still wanted to share because I think these are helpful. 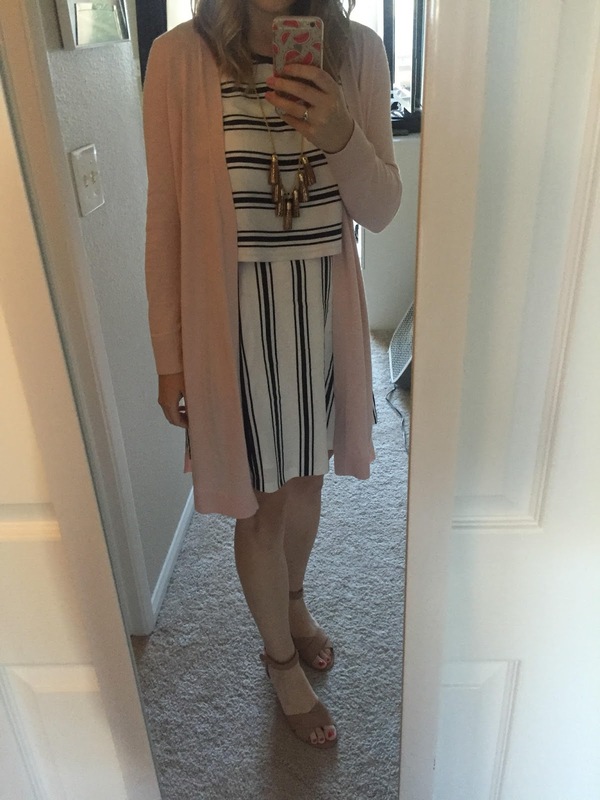 This blush pink cardigan is all kinds of perfect. It's very similar to the one I blogged about earlier in the week, but I actually like it better! It's softer and less expensive :) fits TTS, I ordered a medium. I already wore it yesterday! 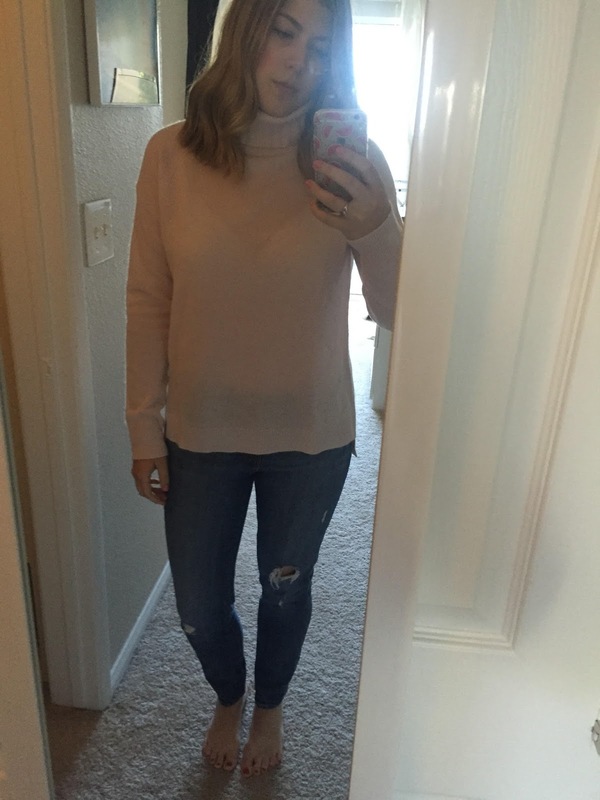 I wanted to love this blush pink cashmere turtleneck because it's the perfect color at a great price, but I just couldn't get over the asymmetrical cuts on the bottom. It's pretty sheer too. I don't think the pictures online truly reflect what this sweater looks like, so hopefully these pictures help you! I will be returning this item. The fit is TTS, I'm wearing a medium. This BP camel cardigan is all kinds of amazing for only $32! I know these pictures are terrible, but this looks exactly like the pictures online. It fits TTS if you're looking for a looser fit (wearing a medium) and is extraordinarily soft for such an inexpensive item. I'm considering buying it in another color :) definitely keeping and I can't wait to wear this over a black turtleneck with a skirt and black tights in the fall! I'm on the fence about this Eliza J ruffle hem fit and flare dress. Help me decide! 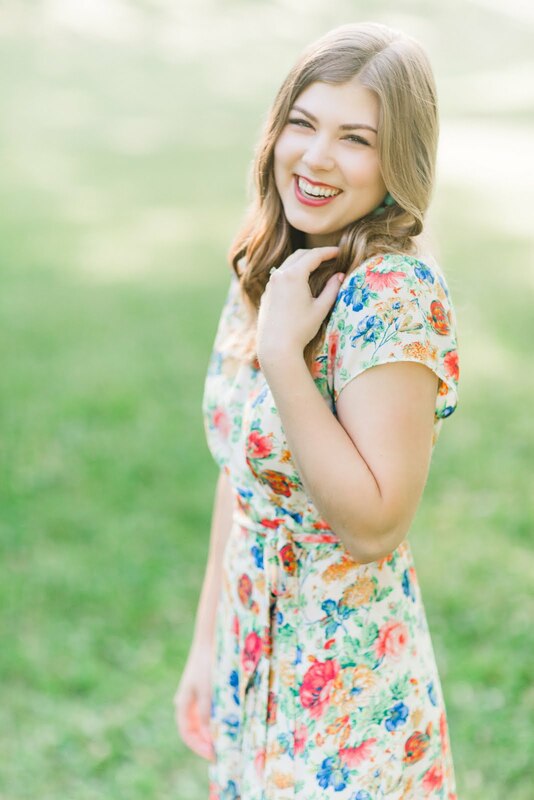 I love the pictures online and it's nice quality, but I can't decide if I love it on me. It's a little tight in the stomach, which I don't love to show off. I would say it fits TTS, I'm wearing an 8. Can't decide whether to return or keep. This black Halogen blouse was another case of misrepresentation on the Nordstrom website. You can't see that the sleeves are slit online, and I really didn't like this detail so I will be returning. Again, this fit TTS. I bought these black Corso Como over the knee boots mostly just to try them on. I had never actually tried OTK boots and wanted to give it a shot with a pair that looked pretty similar to Stuart Wietzmans. I'm honestly torn. I think these are really cute, but I don't know if they're "me." What do you guys think, yay or nay? You can see a little more of these boots on Snapchat (myinnerfabulous) if you're so inclined to help a girl decide! Will you be shopping the sale? Would love to know what you bought/are going to buy! Dress: Nordstrom (similar). Trench coat: Ellen Tracy via Nordstrom (very similar). Shoes: Kohl's (similar). Clutch: Gap (similar). Sunglasses: Target (very similar). Looking at these pictures I'm realizing that I need to go get the sleeves of this coat hemmed😂 Oh well, let's talk about this coat. First I need to tell you a story about my current trench coat. I bought it just before I studied abroad in London circa 2013. Makes sense, right? Well it made so much sense that I ended up wearing it literally every single day that I was there and pretty much hated it by the time I got home because I'd over worn it. Fast forward to 2016 and I still have the same trench coat. It's kind of falling apart and I still harbor some of that hate from 2013. I've been thinking it was time to upgrade for about a year now, but couldn't find something I loved until I came across this faux suede trench coat. Now I know what you're thinking: that doesn't make sense, isn't it supposed to be waterproof? Well normally I would be right there with you, but I do live in California where it hardly ever rains, so I think I can swing it! I really love the unexpectedness of such a classic piece in a different material. I was worried it would look too '70's or kind of creepy, but it's perfect! I hope your week is going well! Be sure to stop by on Friday as I'll be sharing my Nordstrom Anniversary sale picks (and some fitting tips on the items I bought)! If you follow me on Snapchat (myinnerfabulous) then you already got a little peak of this cardigan, but I thought it was too good not to share here as well. 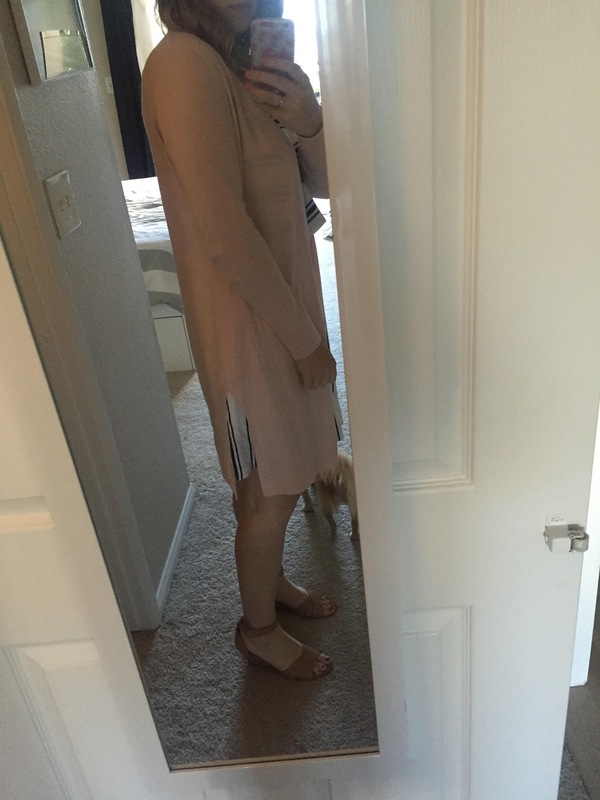 For a long time I had lamented that cardigans ruined cute dresses. I always hated when I had to put a cardi over my dress because I was never able to find ones that were the right length. That is until I struck gold with this Halogen cardigan from Nordstrom. I've styled it with three different dresses below for the full effect :) you can see that it pairs well with fit and flares as well as sheath dresses and I think it would look amazing with bodycon dresses too. It's honestly the perfect third piece! Look one Dress: J. Crew Factory (similar). Cardigan: Halogen. Belt: Target. Purse: Tory Burch (similar). Shoes: Target. Sunglasses: Illesteva. Look two Dress: Gap Factory (similar). Cardigan: Halogen. Purse: Old Navy (similar). Shoes: Dolce Vita (similar). Sunglasses: Illesteva. Look three Dress: H&M (similar). Cardigan: Halogen. Belt: ASOS. Purse: Phillip Lim for Target (similar). Shoes: Banana Republic (similar). Sunglasses: Ray-Ban. Necklace: Odette and Ophelia c/o. How was your weekend? Mine was pretty much spent playing volleyball, a nine hour tournament on Saturday to be exact, and then recovering from said volleyball.